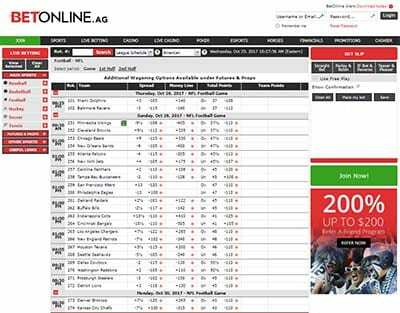 BetOnline.ag is an online betting site based and licensed in Panama. With its own dedicated esports section offering several markets on the world’s most popular titles, including CS: GO, Dota 2 and Hearthstone, BetOnline also impresses thanks to its extensive wagering options on traditional US sports and its separate casino and poker sections. Our review will explain the advantages BetOnline provides when betting on esports, along with some of the unfortunate compromises and realities North American esports bettors must face if they wish to place a wager on their favourite video games. BetOnline is a online betting site primarily for USA customers. It is one of the few US-facing betting sites that is properly licensed and regulated, and one of the only venues to accept sign-ups from all 50 states, despite the wildly different sports betting laws enacted in each territory. BetOnline ultimately leaves it up to the user to decide whether they are satisfied betting with their local legislation before registration, but we always advise brushing up on your local, state and federal sports betting laws for complete peace of mind before betting on esports. If you are worried about any legalities, just know that no US bettor has ever been in trouble for betting at an offshore online sportsbook or BetOnline specifically. BetOnline additionally requires all new sign-ups to be over 18 years of age or above the legal age for gambling in your country or state of residence. BetOnline does not openly state it accepts bettors from other countries, but if you are outside of the USA and want to user their services, you can register for an account and begin betting with ease (in USD currency only, of course) – just so long as your region is one of the specifically listed accepted countries in their registration menu. Like all online sportsbooks, certain countries are excluded and some restrictions are upheld due to differing online gambling laws. The following countries are restricted from creating an account at BetOnline: Egypt, Ghana, Indonesia, Macedonia, Malta, Montenegro, Morocco, Nigeria, Pakistan, Panama, Serbia and Ukraine. Looking for an alternative esports betting site that’s a better fit for users from your country? Please read our best esports betting sites guide to find the best locally licensed and internationally regulated options for you. BetOnline.ag presently offers two regular match deposit welcome bonuses for all new sign-ups who create a sportsbook account and deposit at least once with the site. 1. 50% Welcome Bonus: BetOnline will match your first ever deposit using your payment method of choice up to 50%. You must deposit a minimum of $25 to be eligible for the welcome bonus, which BetOnline will match up to a maximum of $2,500. Also make sure to enter the promo code ‘NEW2500’ at the cashier while making your deposit, and the credits will be in your account balance in seconds. 2. 100% Bitcoin Bonus: BetOnline will match your first ever deposit using bitcoin cryptocurrency up to 100%, effectively doubling your funds. You must deposit a minimum of $20 to be eligible for the incredible bonus, which BetOnline will match up to a maximum of $1,000. Make sure to use the special promo code, ‘BTC2017’ at the checkout before processing the deposit, and the credits will be in your account balance within seconds. BetOnline imposes wagering requirements (also called rollover rates) on all of its bonuses, which essentially are amounts players need to clear in order to withdraw their winnings made from their bonuses. 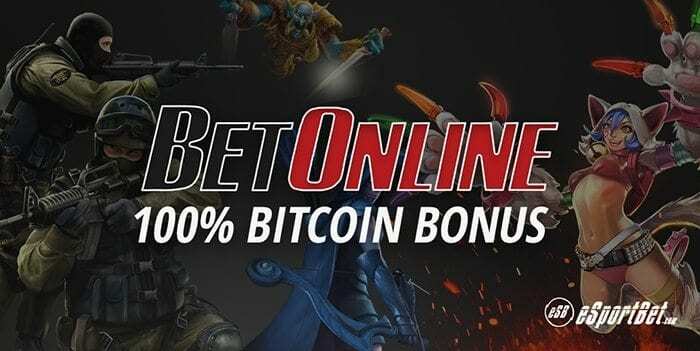 Their current rollover rate is X10 (ten times) and 14X (fourteen times) for the welcome bonus and bitcoin bonus, respectively, which is much higher than other comparable US-facing online esport betting sites like Bovada. Essentially, you will need to bet that rate x the amount of your initial deposit and bonus before you can retrieve your money, and given there is an unnecessary 30 day block before you can even request it, BetOnline’s bonuses aren’t as enticing as they initially appear. Overall, BetOnline’s welcome bonuses are generous in amount but the value is outweighed by the overly excessive wagering requirements that will no doubt force the majority of players to burn through their bankroll before they can enjoy the fruits of their winning bets. Bovada’s 6X rollover rate and equally generous bitcoin welcome bonus is much more attractive at this time. BetOnline never used to be the prettiest online betting sites out there, but it has since made decent strides into resembling something that is both functional and aesthetically pleasing. For desktop users on Linux, Mac OS X and Windows PC, accessing BetOnline’s site is hassle free and everything loads cleanly and super-fast. Its basic red, white and black site theme is much easier on the eyes these days (it used to look like a late 90s relic until a fairly recent revamp). Its various casino, poker, esports, racing, sporting and live betting markets are neatly categorised and easily accessed on the main horizontal nav-bar at the top of every page, along with other important access points like the cashier (to find BetOnline’s various options for depositing money to bet and for withdrawing winnings) and promotions (for BetOnline’s latest and ongoing bonus offers). The vertical menu on the left-hand side of every page is an expandable menu covering main sports (most popular betting markets, of which esports currently is not part of), futures and prop bets, other sports and useful links to their stats center, wagering terms, FAQ sections and other helpful guides on the site’s rules and bonuses. For mobile users on Android, ColorOS, iOS, Windows and other modern-day smartphones and tablets, BetOnline’s site is neatly condensed and highly optimised for the smaller screens and touch-based inputs of our portable devices. All racing and sporting betting markets, along with the aforementioned other important pages are neatly tucked away in their handy drop-down menu, making it so mobile users don’t have to scroll through large amounts of text to get a bet in. However, that’s where our praise ends for the mobile BetOnline site, as their esports section is entirely inaccessible even if you manually search for it – we suspect its one part of the desktop site not yet transferred to mobile versions. If you prefer to bet on your favourite esports on your phone or tablet, this seemingly minor omission may prove much more problematic for our specific interest. If you prefer to download dedicated programs and software to your computer, BetOnline offer full download versions of its sites for PC and Mac OS X desktop users. We gave it a quick try but concluded it is unnecessary as you have full access to everything BetOnline has to offer via the standard Web browser version. What esports events can I bet on at BetOnline.ag? BetOnline’s esports betting markets heavily focus on the most popular esports titles and home-grown leagues played in the United States professionally, such as Counter-Strike: Global Offensive, Dota 2, Hearthstone and League of Legends. Given the US is one of the esports industry’s biggest markets, we’re not surprised, but we’re also glad to see several betting options available for niche overseas esports tournaments – Chinese players will love being able to bet on the popular (but controversial) King of Glory MOBA, while mobile gamers and fans of Vainglory will probably be delighted to see their game recognised by a sportsbook for once. Most types of bets available at BetOnline for the esports supported are moneyline (straight winner), handicap and Map Winner wagers. This is across all titles, and we could not find the more game-specific bets unique to each title (First Blood for CS: GO, for example) that are usually offered at other online esports betting sites, lowering the site’s appeal for esports betting somewhat. That last point is a shame, because all things considered, BetOnline have put some seriously decent effort into making their esports betting hub appealing. They do so many of the little extra features right, such as displaying all titles and betting options are neatly via four main categories – Live, Today, Early Markets and Outrights – rather than separately buried under an excessive amount of sub-menus. You can also quickly find all betting markets by game on the left-hand side menu, and BetOnline has implemented a live ticker to make it easier to know when the next match is upcoming and in which timezone. Other neat customisation options BetOnline has implemented for its esports section not regularly seen at other esports betting sites includes the option to change how odds are displayed (American, Decimal, Fractional, Hong Kong), a search filter that allows you to find matches by your favourite professional teams, and a results page which neatly displays the latest match outcomes for convenient tracking. But by far the best feature we discovered during our testing period are the high-quality Twitch livestreams linked underneath every single esport event and its offered betting options on-site, giving you quick access to a free stream to watch the event live. This little detail is definitely something other online sportsbooks rarely bother to implement. BetOnline have an extensive range of payment methods and payout options on-site, with a detailed deposit and withdrawal FAQ answering the majority of questions. Other US-facing online sportsbooks are extremely obtuse when it comes to the deposit process (due, in part, to the complex laws restricting many traditional funding methods for US bettors) so it’s refreshing to not have to go through the usual hassle of verifying basic queries with customer service representatives. Check out BetOnline’s cashier page for more detailed information on transaction processing times, service fees and minimum and maximum deposit and withdrawal limits. The United States Dollar (USD) is the only currency supported at BetOnline.ag, due to the site catering mainly to customers from North America. Users from other accepted countries will have to be aware that currency conversion fees apply prior to wagering at BetOnline. BetOnline by default is displayed in English but a Chinese language option is available for esports bettors to take advantage of. Just click China’s flag in the language drop-down menu displayed on the top right-corner of the esports hub page. We hope to see more languages supported at BetOnline in the near future. BetOnline’s customer support is was, unfortunately, below average in helpfulness, responsiveness and professionalism. Half the time we spoke to a representative during our latest testing period, they didn’t even know or weren’t aware the site had esports markets available, which is quite disappointing. The other half of the time was spent waiting for them to give us a non-textbook responsive to specific, but ultimately basic queries about deposit limits, bet types and bonus code redemption. This is one area BetOnline seriously need to improve on, given their long presence in the online sports betting industry. 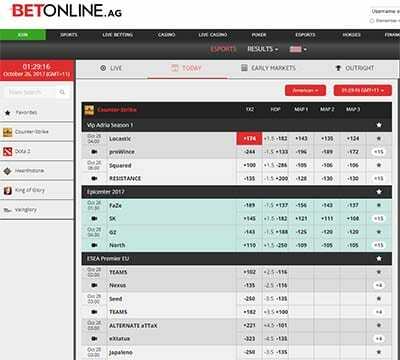 BetOnline.ag has the foundations to be a great esports betting site for US and international players given it has already actively put in effort into its various esports betting markets and its management is obviously much more aware of the industry’s growing popularity compared to other US-facing esports betting sites like Bovada.lv, given they have full Chinese language support and livestream links for every event they take bets on. BetOnline need to make the esports section of their site available on mobile, and improve their customer support before we give them a more glowing endorsement, but for savvier or more experienced esports bettors out there, so long as you can put up with a few head-scratching omissions, the betting options, odds and niche markets make BetOnline a worthwhile sportsbook to frequent for the casual bet on CS:GO or Dota 2 every so often.